At Choices we are just one part of a greater picture, made up of different organisations across Scotland who are working together to serve and transform their local communities. 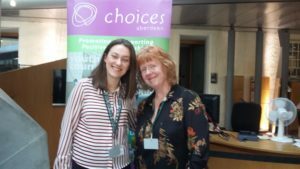 In April we were given a glimpse of this picture, when we were invited by Care for Scotland to attend the Serve Scotland Parliamentary Event in Edinburgh. This was a fantastic chance to share more about what we do, to learn about the work of charities across Scotland, to encourage each other and meet our MSPs. We took banners and flyers, but the centrepiece of our display was our lip-balm stand, where delegates and guests could have a go at making their own lip-balm. We use this, as well as other creative activities, to promote out work and to facilitate our relationships both with youth and creative therapy support groups. Doing something practical and creative is a great way to forge relationships and open up discussion, and we find that making lip-balm is a really simple way to get people talking. This went down a treat in Edinburgh, with lots of the MSPs having a go. This was a real time of celebration and we felt so encouraged by the great work going on across Scotland, and privileged to be able to share what we do at our Parliament. We are really grateful to Care and Serve Scotland, and hope to build on the great contacts made during the event. To request a lip-balm making event, or to find out more about creative therapy, email us at mail@choicesaberdeen.ac.uk.